Something unexpected from Hermès at Baselworld this year. Created in collaboration with Jean-Marc Wiederrecht, the Arceau Le Temps suspendu is an interesting concept similar to the Maurice Lacroix Memoire 1 of several years back which promised much but never materialised. Wiederrecht runs Agenhor, the complications specialist, especially with retrogrades, responsible for some of the most creative retrogrades of recent years, most famous Van Cleef & Arpels Poetic Complications and the MB&F HM2. As its name suggests the Arceau Le Temps suspendu suspends time: the nine o’clock button brings both the hour and minute hands to noon and hides the retrograde date hand. The movement, however, continues running, measuring the elapsed time. Press the button again and the hands fly back to their rightful position, taking into account the period that has passed. This essentially is a triple retrograde watch, albeit cleverly and creatively executed. This reminds me of the Franck Muller Secret Hours, but in reverse. The hands of the FM are always at 12 but they jump to the correct time display when a pusher is depressed; release the button and they fly back to noon. 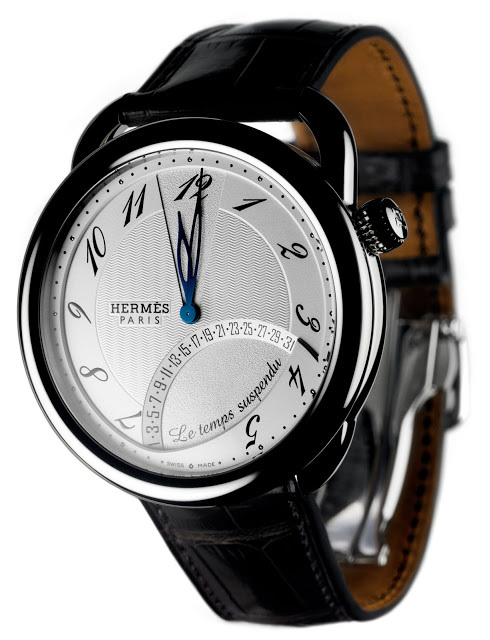 This Hermès is novel concept, though no doubt expensive as everything from Hermès is, and reflective of the effort Hermès is putting into watchmaking. Kudos to Hermès for working with Agenhor too. The design however lacks finesse in my opinion, it’s a equestrian inspired yet lacking character; it looks deflated and soft. 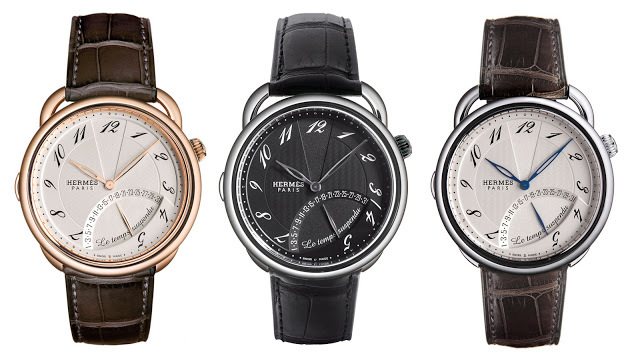 Most of what Hermès makes is tasteful but somehow I find their watches generally bland.